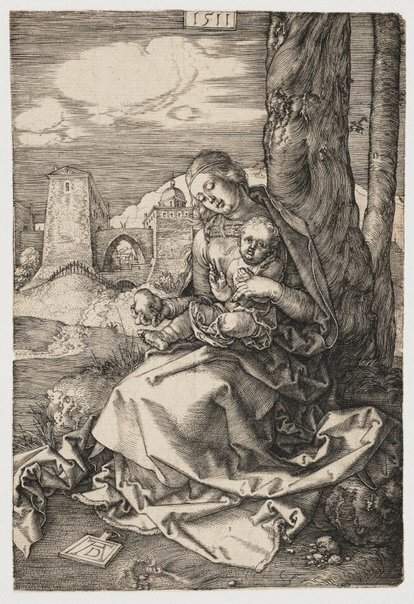 The Virgin offers the Christ Child a pear (a symbol of pacification) instead of an apple, which would remind the viewer of the Fall of Man. The relationship between the mother and the child is less formal than Dürer’s earlier renditions of the theme. The background affords a deep view through the pointed arch of a massive city gate. But our eye is also encouraged to wander over the surface and relish details such as the swirling folds of the Virgin’s drapery, the spiralling tree trunk and the uniform hatchings of the sky with its drifting clouds. Signed l.l., [incised plate] "AD [artist's monogram]". Dated u.centre, [incised plate] "1511". Renée Free, AGNSW Collections , 'The Western Heritage, Renaissance to Twentieth Century', pg. 108-172, Sydney, 1994, 112 (colour illus. ).